Beware of Holiday Swimming Pools that can Cause you Illness. Your hotel swimming pool is one of the most important parts of your holiday experience. Images of clear blue waters and taking a dip to cool off and relax are what many people dream of before their holiday. However swimming pools on holiday are commonly associated with illness outbreaks because the water can contain bugs that can make you ill. The most common swimming pool bugs abroad are cryptosporidium, contamination by giardia lamblia and E. coli. Other problems which can be caused by swimming in thea contaminated hotel pool include ear infections, chlorine burns and other allergic reactions. Holidaymakers who become ill on holiday often put it down to the food that they have eaten, especially if they are suffering with vomiting and diarrhoea. However, gastroenteritis can also occur as a result of swallowing dirty swimming pool water. Ear infections are also a common but very painful problem that affect thousands of holidaymakers each year. The problem arises because swimming pools are not filtered adequately in relation to their size. The water becomes contaminated with germs and bacteria which then cause ear infections. The size of the swimming pool and the sheer volume of people using it mean the water is soon polluted with unwanted foreign substances. These include sweat, mucus, dead skin, saliva, faecal matter, make-up and sun cream. Poor filtration and a lack of water hygiene standards cause the spread of infection! Are holiday Bugs Resistant to Chlorine? It is difficult to ensure that hotel swimming pools are free from parasites as many pathogens have developed a resistance to safe levels of chlorine. Germs are often able to contaminate the pool water even after it has been treated with chlorine. As many as 30 different types of bugs can exist in a swimming pool at one time, although Cryptosporidium and E. coli can only be caused by the presence of faecal matter in the water. This means that holidaymakers with diarrhoea and babies without waterproof nappies are the main cause of such illnesses as a result of hotel swimming pools. How Can I Avoid the Problems? 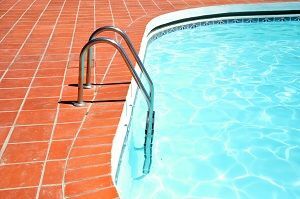 What are the Risks of Swimming in a Poorly Maintained Pool? E. coli infection – leads to severe stomach illness. Young children are particularly vulnerable to this and it can lead to kidney damage. Cryptosporidium infection – leads to severe diarrhoea for about two weeks. Pseudomonas aeruginosa – causes vomiting and diarrhoea and affects the lungs, any open wounds and the urinary tract. Acanthamoeba – infection of cuts on the skin or scratches on the eye resulting in painful, sore, red, swollen eyes. If left untreated it can lead to blindness. Ear infections – painful irritation of the ear drum that can last for several days and requires anti-biotic treatment. Chlorine Burns – allergic reaction to chlorine in the water which leads to reddening, burning and blistering of the skin. This needs to be treated immediately in the same way that you would treat a thermal burn. Did You Experience Complications From Unsafe Water? Many people suffer secondary conditions as a consequence of illness outbreaks from pool water. Shock treating the water with a high amount of chlorine brings its own problems and issues. Some hotels will simply dump large amounts of chlorine into the water thinking that will do the job of making the water safe. However, people swimming through a large patch of freshly added chlorine may find there skin burned by the high concentration in the water. The chlorine can be very irritating to the skin causing reddening, burning and blistering and must be treated immediately in the same way that a thermal burn would be treated. Simpson Millar LLP can help you if you have been affected by a swimming pool illness or allergy. Our dedicated team of travel lawyers have extensive experience in dealing with illnesses caught from the hotel swimming pool and can help you claim compensation from your tour operator.